The mountain community of Red Ledges is a 2000-acre natural playground with stylish mountain contemporary homes and endless recreation. By summer, there is top-notch golfing, tennis, hiking, riding, swimming, trout fishing, chuck wagon rides, and more, but when winter descends and champagne powder covers those crimson rocks, the joy of Utah—one of the country’s greatest destinations for skiing and alpine play—unfolds. Set in the quaint town of Heber City, where time seems to slow a bit and friendliness is a natural inclination, the family-oriented community of Red Ledges sits an easy 15 minutes from Park City where three world-class ski resorts await. Park City Mountain Resort boasts a famous snowboarder and freestyle-skier terrain park; families flock to Canyons Resort for its diverse trails and playful ambiance; while Deer Valley Resort ranks as the top ski destination year after year, known for its grooming perfection, gourmet cuisine, and European-style ambiance. Another nine superb ski resorts lie within a 60-minute radius of Red Ledges, explaining Utah’s reputation as the country’s finest ski destination. For those partial to luxury skiing in the “Greatest Snow on Earth,” members of Red Ledges have VIP access to Deer Valley Ski Resort at the slope side Deer Crest Club. Skiers can make the Deer Crest Club their swanky private basecamp, where ski valets, lockers, a private bar, sprawling sundeck, and delicious gourmet food tip the opulence scale of this alpine adventure. Back on property, a world of wintry activities bond families and creates memories of snow-filled fun. 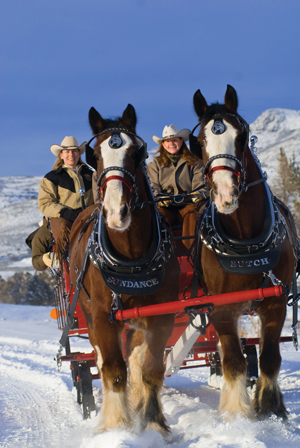 Red Ledge’s equestrian program runs 365 days a year for myriad horseback adventures and family sleigh rides led by Butch and Sundance, the resident Clydesdales. Residents and their guests can explore the landscape by dogsledding, snowshoeing, or cross-country skiing, and the possibility of spotting fox, moose, elk, and eagles adds to the joy. Red Ledges is located just minutes from the Soldier Hollow Olympic venue. 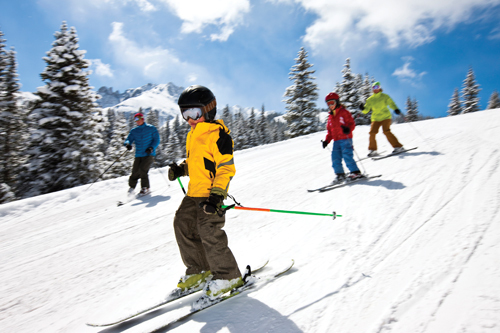 It provides additional cross-country skiing, while kids love the thrill of snow tubing and sledding. Red Ledges offers a wide range of luxury home ownership options from turnkey stunners to custom homes. The community has a collection of architecturally striking mountain villas, cottage homes, and club cabins, along with sprawling estate sites for bespoke dream-home build-outs.For those interested in making Red Ledges their lifestyle, the premier four-season community has 1,200 estate homesites and thoughtfully designed residences with dramatic views of the unique red rock formations and surrounding Wasatch and Uinta Mountains. 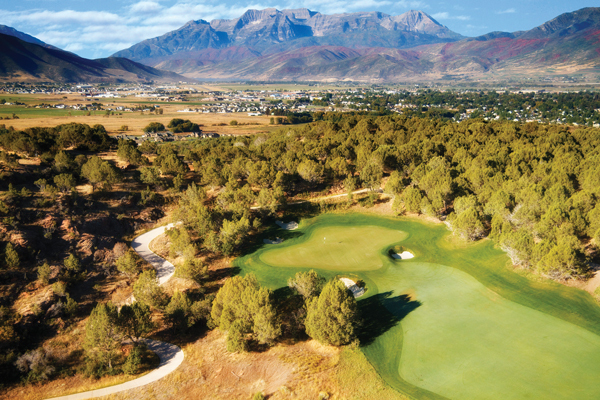 In addition to top amenities such as their 18-hole Jack Nicklaus Signature Golf Course, the Jim McLean Golf School, the Cliff Drysdale Tennis School, an extensive equestrian program, and a swim and fitness club, Red Ledges has just broken ground for their new 13,800-square-foot clubhouse. Set to open in the fall of 2014, this community centerpiece will be home to a gourmet restaurant, stylish bar, lavish locker rooms, a sports shop, and comfortable gathering spaces for members to mingle. Built in harmony with the surrounding natural beauty, the clubhouse will also offer soul-stirring views of Mt. Timpanogos and the pastoral Heber Valley. With a local private airport in Heber and the Salt Lake City International Airport an easy 45-minute drive away, Red Ledge’s ease of accessibility is another compelling draw to this pristine property. After experiencing Red Ledges, it becomes evident that this four-season playground embodies the best of what Utah has to offer: open space, hypnotic views, tranquility, adventure, and nature in all her glory. For people interested in possibly purchasing a Red Ledges’ property, experience the Stay-and-Play package, which includes a two-night stay in one of the luxurious mountain cottages, a tour of the Red Ledges property, and a choice of a round of golf for two, Jim McLean School golf lesson for two, Cliff Drysdale Tennis School lesson for two, or horseback riding lessons for two at the Red Ledges Equestrian Center.